GT Agility pro 3 speed commercial transmission: A commercial grade, all mental, constant mesh, oil lubricated, cone clutch gear box featuring precision bearings to the shafts. 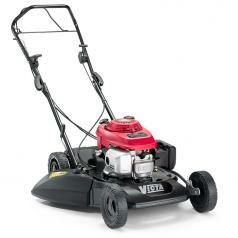 Designed for commercial applications, it provides reliability and durability. Ground speeds at 3200rpm are: 1st – 3.74km/h, 2nd – 5.11km/h, 3rd – 6.63 km/h, providing the perfect speed-to-job ratio demanded by contractors and home owners with large yards. Steel Rear Discharge Chute: Designed to work with out a catcher or mulch plug, the rear discharge chute will spread the grass across the full width of the chute and direct the cut grass towards the ground. 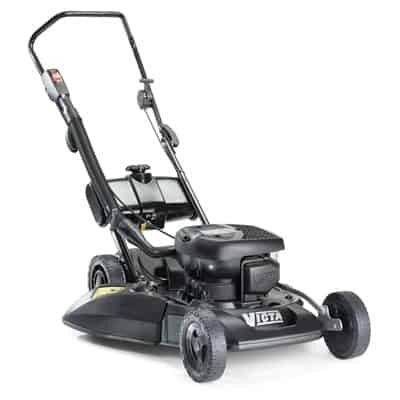 This allows the user to mow at any height without the need to stop mowing to empty a catcher, reducing mowing time and running cost, plus recycling the cut grass. Bolt in Axles: The front axle is held firmly in place with steel bearing plates bolted directly to the chassis, which also securely retains the plastic axle pivot bush tight. The rear axle is bolted directly to the chassis through the rear bearing chassis, providing a strong fix to the mowers. Robust Handles & Heavy Duty Controls & Cables: Large diameter and heaver gauge upper and lower handles withstand the heavy forces applied to provide extra durability. The lower handle has additional bracing, reducing any lateral movement. The heavy duty control and cables are extremely robust and resilient to breakage and wear, providing great longevity. Professional Cast Aluminium Wheels & Precision Bearings: Professional grade, heavy duty, cast aluminium 8″ front & 9 1/4″ Rear wheels with synthetic rubber tires are extremely tough and are designed to operate under commercial conditions. Each wheel is complemented by dual 6202 precision sealed bearings, making the mower easy to push, virtually maintenance free and long lasting. Large Capacity Dacron Catcher: The double lined Dacron catcher with dust cover holds 80L. The fabric catcher improves airflow maintaining catching performance, while the dust covers directs airflow downwards, reducing dust updraft for the operator. Bumpers: A front bumper and engine guard offer protection to the cutting chassis, front axle and engine. These bumpers also provide a valuable lifting handle and tie down point to secure mower. 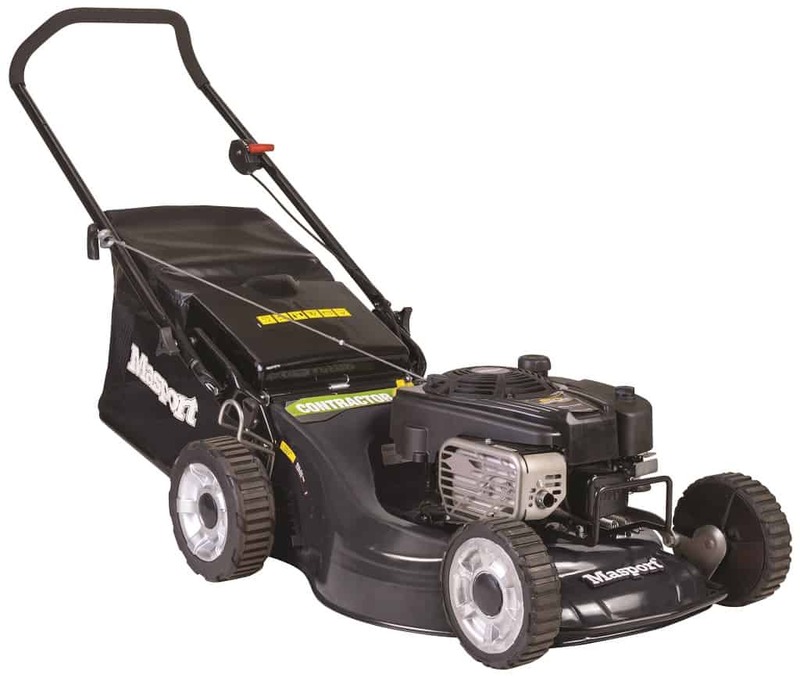 The Masport 21″ professional mower features a commercial grade Briggs & Stratton 850 engine. 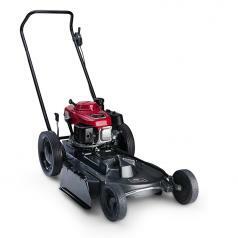 This mower is designed for large yards, small acreage and commercial use. The heavy duty high arch steel chassis is able to withstand sandblasting and hard impacts and is combined with the Quadcut 4 blade cutting system resulting in superior cutting, mulching and catching performance. The heavy duty cast alloy wheels are extremely tough and roll freely on hi precision hardened steel bearings.